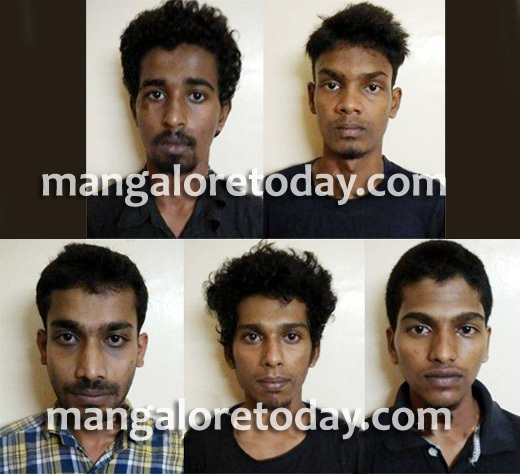 Mangaluru: July 31, 2015: The city crime branch (CCB) arrested 5 persons on Thursday who were hatching a plot to loot people near St Joseph Nagar road here. The accused has been identified as Santhosh Kumar (19), a resident of Jeppu, Gautam (19), a resident of Kankanady, Nithin Kumar (24) of Pandeshwar and Dheeraj (24) and Dhanraj (19) from Padil. The police got the information that a Scorpio car was moving around suspiciously near the entrance of St Joseph Nagar Road. Acting on the information, the police arrived at the spot and investigated and took 5 into custody. It is learn that the 5 accused were planning to commit a theft at some houses of Big shot people near Valencia. The police seized two Machetes, an iron rod, three mobiles sets and a Scorpio car from the accused. It is said that, Santhosh Kumar was also involved in other cases relating to Kidnapping and robbing in 2014. He was arrested and was in jail for 4 months. All the accused and the weapons seized were handed over to Mangaluru Rural Police for the investigation. The operation was led CCB inspector Valentine D’souza under the guidance if Commissioner S Murugan and DCP Shantaraj. The criminals one arrested in the case should never be released on bail. Thanks to CCB . The criminals arrested should not get bail. These youths must be treated black and blue!